If you’re looking for something that ticks all the vintage boxes while retaining genuine individuality, then why not try something Xotic? Brilliantly finished with a unique feel. Range of vintage tones at a competitive price. Some just won’t want this style of guitar without the Fender name on the headstock. Anyone with an ear for tone will know all about US manufacturer Xotic, whose pedals have graced the ’boards of the great and the good for two decades. Units such as the EP Boost have reached almost mythical status with many players leaving theirs permanently on because they add that classy ‘something’ to the sound. 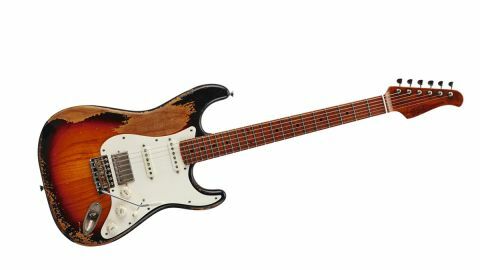 The question is, can Xotic bring that same expertise to a range of boutique remakes of classic Fullerton designs such as this California Classic XSC-2, a more-than-a-little-obvious nod to Leo’s Stratocaster? The XSC-2’s body is alder and our guitar boasts an AAAA ‘master grade’ roasted maple neck and a covered humbucker at the bridge. Otherwise, at its heart is the 65-year-old recipe we all know and love, with several decades of artificial ageing that includes expert lacquer checking and much of the finish being worn away. Radical relic’ing is de rigueur these days, but divides opinion more than ever. Whatever your view, when it’s done this well the workmanship can’t fail to impress. Pickups, vibrato springs and bridge saddles are Xotic’s own Raw Vintage brand (two RV-50 single coils and an RV-PAF humbucker). The company makes a big deal about forensically analysing vintage components, and how its use of period-correct materials (including Alnico V magnets, Formvar wire and nickel plating directly onto steel) has a cumulative affect on overall tone. Even the springs’ tension is recalculated; Xotic recommends the use of all five for operational stability yet surprising ease of waggle. Tuners are Gotoh’s ‘Kluson look-alike’ Magnum Locks with no rear thumbwheel. Instead, you simply thread the string through the peg, tune up and it self-tightens: a brilliantly simple and elegant solution to an age-old tuning problem. The bridge base and vibrato block are Gotoh, too, only the saddles being Raw Vintage. Pickguard, pickup covers and knobs are parchment in colour with all edges rounded off - as, indeed, is the headstock - to appear naturally weathered. But there’s no rear vibrato plate and no holes drilled should you want to fit one. Top players talk about improved sound quality as a result of removing the cover and, whether that’s true or not, string changing in a hurry is much simpler. All these touches add up to a guitar that’s more than the sum of its parts and does feel completely hand-crafted. Oiled necks have been a feature on Music Man guitars since the 80s, but many makers have now adopted the process and its drag-resistant ‘natural’ feel is a welcome feature here. Add to this beautifully dressed jumbo nickel frets and a ‘modern C’ neck profile that hugs the palm, and you have a delightful playing experience. Action isn’t the lowest we’ve played and string tension not the lightest, yet bluesy bends and vibrato feel smooth and effortless on the 241mm (9.5-inch) radius ’board. Coming in at a smidgen over 3kg, the XSC-2 is a breeze to hang around the neck, and even with the full five-spring complement, the vintage style vibrato base sits off the top enough to allow gentle chord wobbling and vibrato. It feels compliant and stays tuneful, even if the arm was angled rather high for this reviewer. Roasted maple is a relatively recent discovery for guitar builders, but is now a common feature on brands large and small. As well as imbuing the timber with a wonderful nutty hue, it better resists temperature and humidity changes and apes years of natural drying. This mimicking of the ageing process is also said to enhance tone. Plugging into the ever-faithful Blues Junior reveals a sound set that’s broad and transparent. There’s no disparity between the three pickups’ volumes; the RV-PAF doesn’t dominate but simply adds a more muscular bridge pickup thump. Although lighter toned than our R7 Les Paul, it’s got a good bark that’s perfect for tough rhythm or riffs and higher-gain leads that remain articulate. There’s a tone control for this pickup, too, so you can darken it even further should you wish - it sounds monster this way with a Fulltone OCD kicked in. The single coils are spankier than those on our Custom Shop Strat with a clear, almost glassy top-end that evokes Stevie Ray and Robert Cray rather more than Rory or Ritchie Blackmore. The bridge-middle combo is particularly potent, and many players could find themselves reverting to it often. Neck and middle is Knopfler to a T, and with delay and a splash of chorus creates a charmingly expansive voice. Neck on its own is that classic ‘woody’ tone that we’ve come to expect from a good Strat - flip from Jimi-style fills on this to a singing humbucker solo on the RV-PAF and bluesrock nirvana awaits. We’d agree that there’s very little modern sounding about this California Classic, and in that regard it’s achieved exactly what it set out to do. Many high-end makers have tweaked Leo’s most famous templates to create their own takes on these highly marketable designs. Even Fender’s own American Originals and Custom Shop Relics only go so far, preferring to average out the kind of Strat or Tele people want today and then make versions of it at various price points. The luxury for Xotic and others is that, by building in far smaller numbers, it can get closer to that vintage DNA due to obsessive attention to the minutest details. It can also lavish time on the finishing and setup to create instruments that truly seem custom made: a case in point being that our XSC-2 feels nothing like a Fender; it remains comfortable and familiar but perhaps more like an Eggle or a Suhr. We were somewhat ambivalent about the California Classic before we spent time with it. But it’s wormed its way right into our affections and we’d happily play it for what is it: a beautifully crafted guitar that’s ultra cool, does all the right things and with no surprises. If you don’t like this level of distressing, Xotic does all kinds of finishes in a veritable rainbow of colours. Prefer three single coils? It has that covered, too. At a few hundred quid under Fender’s current Relic price point, we’d say Xotic’s California Classics represent good value. These guys know all about tone and have gone to the nth degree to create a range of master-level instruments. If you’re looking for something that ticks all the vintage boxes while retaining genuine individuality, then why not try something Xotic?